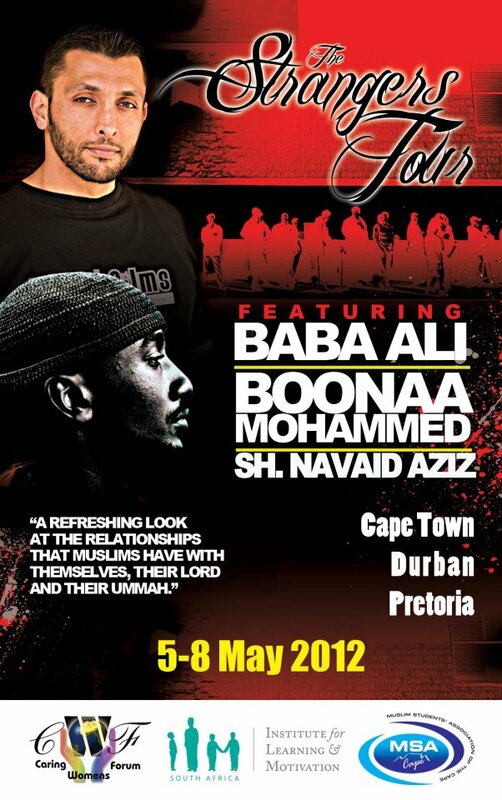 The MSA of the Cape has teamed up with several organisations to bring “The Strangers Tour” to South Africa. This internationally-renowned variety show boasts the talents of Muslim comedian Baba Ali (USA), award-winning poet Boonaa Mohammed (Canada), and popular scholar Navaid Aziz (Canada). The event – which takes a refreshing look at Muslim life and relationships – heads to Durban, Cape Town, and Pretoria this May. “The Strangers Tour” has been phenomenally successful worldwide, selling out in many of the 20-plus cities it’s reached in the UK, Canada, Europe, and Australia. Strangers is a dynamic and inspirational three hour program that uses a mix of poetry, comedy, and motivation to explore the relationships Muslims have wthin themselves, with their Creator, and with the larger community. Navaid Aziz (Canada) is a dynamic, youthful scholar and counselor known internationally for his enlightening and heartfelt motivational talks on Islam and life. The show heads to Pretoria on Saturday, 5th May, Cape Town on Sunday, 6th May, and Durban on Tuesday, 8th May, and is brought to South Africa by MSA of the Cape, ILM-SA, Caring Women’s Forum, and the Willowton Group. For ticket information, further details, and the video trailer, visit the Strangers South Africa Facebook page at facebook.com/StrangersSouthAfrica or www.msacape.org. Undoubtedly, Hajj is one of the greatest events in the life of a Muslim – and one filled with many lessons. From the struggles of raising the funds and getting the opportunity, to the patience that’s needed to endure the hardships of travel, and then to the incomparable spirituality felt during the five days of Hajj – pilgrims learn from the different segments of the journey, and hope that they will take those lessons home with them, to apply for the rest of their lives. But for many pilgrims, those feelings can quickly fade once they arrive home, because the contrast between the lands of Hajj and the ‘normal’ home environment is as striking as day against night. Madinah, Makkah, Mina, Arafah, and Muzdalifah are not the real world. Divorced from the responsibilities of family, work, and home life, the journey of Hajj is like an experience in another galaxy – one where everyone is geared towards worshipping Allah; there’s no immoral advertising, music, and images smacking you in the face every hour; and the only worry each day is making it to the masjid to get a spot for the five compulsory salaahs. But once pilgrims arrive home, they return to the environments of hardship, laziness, and sin. And despite all the wonderful gains from the weeks they’ve just spent as guest of Allah, maintaining a spiritual high under such circumstances is difficult – if not impossible. For a pilgrim, the effort doesn’t end when Hajj ends. Once you’ve gone on Hajj, your life’s work is not ‘done’. Your ticket to Paradise is not guaranteed. You’ve merely improved your chances of getting there – but the hard work still remains. It’s a common cliché to say that the actual Hajj itself isn’t the difficult part – but the difficult part is ‘living’ that Hajj for the rest of your life. But how does one do that when you don’t live in the relatively ‘pious’ universe of Makkah or Madinah? To help answer this question, Cape Town’s Imam Suyuti Institute has initiated a course titled: “Maintaining your Hajj & Umrah: Making it count for the rest of your days”. The first run of the ten week course – which is being taught by Shaykh Riyadh Walls – has drawn a large crowd each week, with attendees eager to extract the spiritual inspiration and practical advice dished out to help them consolidate the lessons of Hajj. 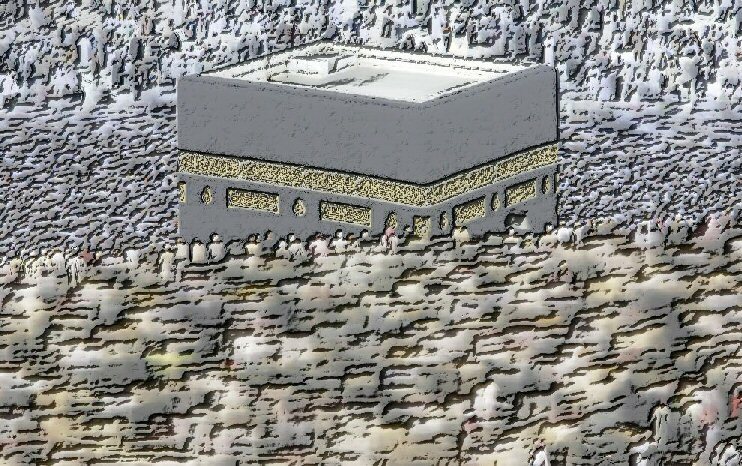 Shaykh Riyadh began by sketching out the model Hajj – that of the Prophet Muhammad (s.a.w.) – before delving into inner dimensions of the journey. As explained, even if pilgrims didn’t realize the spiritual benefits of the different steps at the time, it doesn’t mean they were deprived of that goodness. Those benefits were gained – but the work is to now unlock those treasures and use them to enhance their lives. The Shaykh then analysed Hajj as a parallel to death, explaining how Hajj is a journey to Allah in this world – before we undertake our journey to Allah in the Hereafter. Accompanying this understanding is the concept of Hajj as an expression of inordinate love for Allah – how Hajj helps us show our love, gratitude, and longing for Allah while still in this life. The peak of Hajj – the Day of Arafah – was also discussed. For Hajjis, Arafah serves as the first day of the rest of our lives, because it’s the day when our slates were wiped clean, and our enemy – shaytaan – was disgraced by seeing all his work of misleading us decimated in the space of a few hours, by Allah’s complete forgiveness. Shaykh Riyadh raised critical points here, reminding us that – because of this shame – shaytaan and his allies will try even harder to bring us back into lives of sin and transgression; which means that Hajjees need to work even harder than before if they are to ward off the whisperings and evil invitations of the devils. Also covered was the understanding of Hajj as the ultimate form of repentance, and how one of the greatest ways to maintain the Hajj is to live a life of repentance – each day seeking Allah’s forgiveness for the wrongs you may have done, and each day returning to your covenant with Him. Accompanying the knowledge and spiritual dimensions of the course, Shaykh Riyadh also helped attendees initiate a practical ‘maintenance plan’ – focusing on areas like repentance, taking care of salaah, taking account of one’s self, striving to improve in character, and repairing relationships with others. For many Muslims, Hajj represents the ultimate opportunity to make permanent changes: to drop bad habits, pick up good practices, improve character and conduct, and become the person they dream of becoming. This is so because while other major forms of worship – such as salaah and Ramadaan – are meant to help bring on such change, they are repeated often, and risk becoming ‘routine’ – which can compromise the transformational aspects that they include. Hajj, on the other hand, comes just once in a lifetime (for most) – so it’s crucial that a Muslim makes the most of it, and uses the benefits and lessons of Hajj as the fuel that’ll drive them to Allah’s pleasure, and into Jannah. Courses like these help remind us of where we were and what we did, as well as the promises we made to Allah, and what we need to do to fulfill those promises. Video recordings of the course may be made available later in 2012. Contact Cape Town Muslim Events (info@imamsuyuti.co.za) for further information. And for those in Cape Town, the course’s second run begins this April, with registration closing on 4th April 2012. Registration is available online at this site. I was a latecomer to Islam. No – I didn’t convert into the religion. I was born a Muslim, but for most of my life growing up, I wasn’t really one – not the way I should have been, at least. I lacked the proper understanding, knowledge, and, most of all, commitment to the religion. As a result, much of my life was spent without real attachment to Islam – confined to merely ritualistic acts of worship I was expected to do, and not much interest beyond that. As a child, I learnt Islam’s basics in madrassah, and my family acted as a good moral compass in guiding me through the racially and culturally diverse society that was South Africa in the 1980s and 1990s. I had plenty of exposure to other religions – Hindu family friends, where I’d see their prayer lamps and idols; a Christian junior school, where every morning’s assembly included the Lord’s prayer; and my Jewish high school, where Jewish Studies was a compulsory subject for a couple of years. I always had a conscience about Islam, and what my Creator expected of me as a Muslim. But without practical action, conscience can’t lead you very far. In school holidays, for Friday prayers, and on other religious occasions, I’d attend Islamic religious services, and hear the religious advice given by the imams and moulanas. I’d sometimes be inspired to want to be a better Muslim, but the feeling would fade a few hours later, and I’d continue as normal – not really thinking about my purpose in life or how I could be better to my fellow human beings. changed my entire focus and orientation in life. Such events are common in any religion – not just Islam. Anything could act as a catalyst – from a near death experience, loss of a loved one, a period of desperation, or any other event. Different people have different experiences, yet all end with the same result: a movement from a state of heedlessness to one of consciousness. Over time, I came to learn more about Islam, and firmly believe in its truth – understanding the wisdom behind its acts of worship and social values, and its timeless message of pure monotheism, which was the message of every prophet, including Abraham, Moses, Jesus, and Muhammad (peace be upon them all). I came to understand how, as a comprehensive belief system, it links an individual to their Creator, without any intermediaries; guiding them to live in the way that would bring true happiness, inner peace, and success – both in life and in the realm beyond death. A few weeks ago, I was honoured to perform the Islamic pilgrimage to Makkah – the Hajj. As far as mandatory religious activities go, it’s one of the most important acts in Islam. It’s a journey that re-enacts the life of Prophet Abraham and his family, and draws millions each year – promising great reward from the Creator; and immense liberation, such that the pilgrim returns from the journey completely forgiven from every sin – spiritually, like a newborn baby. It’s a journey of sacrifice, self-purification, and great humility. Pilgrims leave their families and comfortable homes to go all the way to the Holy Land, spending days and nights in a simple, unflattering tent – where the only physical comforts are a mattress, blanket, and pillow. They leave behind the ease of cars for a journey involving walking for miles and miles on dirty, congested roads, in huge crowds that they’d normally run away from. They shed the adornments of plush clothing to wear nothing but two white, unstitched pieces of cloth – wherein they’ll look exactly like everyone else, with nothing to distinguish between a king and a beggar. They go out to a flat, empty plain – in the middle of a desert – to stand in the scorching sun for a few hours, reciting a few words, pleading with their Creator, and crying their hearts out. And they walk around an ancient building, the first house of worship dedicated to the Creator, praising Him and supplicating for all that they desire. The experiences and lessons of Hajj are numerous, but for me, the most important result was the liberation I spoke of earlier – a second chance at life. A person who survives a near-fatal accident may relate, as could a reformed convict who leaves prison as a ‘new’ person. After repentance on Hajj, the feeling of being completely forgiven – for every single sin you’ve ever committed – is truly amazing, and beyond words. It’s like a lightness of the soul – like there’s no longer this burden on your shoulders, and you literally feel pure and clean. Your mind feels more free, your spirit feels light, and you feel so much closer to your Creator. It’s really the most awesome feeling imaginable. And it’s also empowering, because you now have this ‘clean slate’ – this second chance to start your life again, from a state of purity. And with that feeling, you’re more sensitive to every wrong you do. You can recognize it more easily, and you feel the need to repent or make up for it immediately – because now that you’re ‘clean’, you want to stay that way, and never let any spiritual ‘dirt’ pollute your heart again. Naturally, it isn’t possible to remain on such a high for a sustained period. And in the few weeks since Hajj, such feelings of spiritual euphoria have decreased. But the effects of those feelings, and that experience, remain with me, and have hopefully benefitted me as I returned to my normal environment and responsibilities. In Muslim circles, it’s a common cliché to say that Hajj really begins once you get home – meaning that Hajj itself is not the main challenge. The main challenge is what becomes your life’s mission after Hajj: to ‘live’ that Hajj by taking forward what you’ve learnt, and being that better person you were inspired to be. I thank you for allowing me to share this account with you, and I hope that – regardless of your religious persuasion or belief system – you can take some benefit from these words, and that you yourself will have an experience of such magnitude in your life, if you haven’t already. Note: This piece is a deviation from the current Hajj Chronicles series (part 2 of which is due this weekend insha-Allah). This one is a separate article, written for a non-muslim audience, which I hope to publish elsewhere at the appropriate time. As always, comments are welcome. As mentioned in my last post, I’ll be going for Hajj very soon insha-Allah. And that means that I won’t be posting until at least late November. So until then, I wanted to leave you with something that I hope would be of benefit. Many of you may not be fortunate enough to go on Hajj this year, but it’s an event that encompasses the entire Ummah – even those who aren’t there. Actually, more people DON’T go than those that do – since, mathematically, we’re over a billion strong in numbers, but only 3 to 5 million make it for Hajj each year. Remember that these are the best 10 days of the Islamic year (“There are no days during which righteous deeds are more beloved to Allah than these ten days…” – related by Bukhari and Tirmidhi) – so take advantage of them to boost your spirituality and draw closer to Allah. (For tips on how to do that, see the Yaser Birjas article referenced above). Maybe you’ve slipped since Ramadan ended, or maybe you’ve maintained a steady level of consistency. But whatever the case, these coming days gives you the amazing chance to step up and recapture, in some way, the dedication and striving that Ramadan brought. Again, thank you for reading. And do come back to visit in a few months. 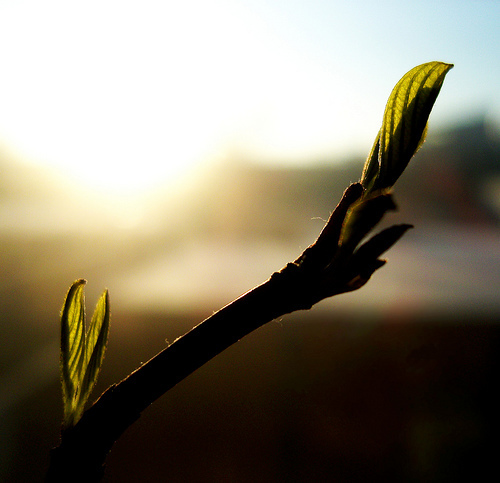 I hope to return to this blog in a few months with some pictures and other good things, insha-Allah. For those in Cape Town, there’s a Ramadaan preparation seminar at UCT in a few weeks. Details are in the advert if you’re interested, and clicking on the image should take you to the organisers’ web page, where you can register. Terms like “balanced”, “moderation”, and “middle path” are often associated with the ideal of Islam. Muslims are meant to be a ‘middle nation’ between extremes, yet in today’s times, with increasing fragmentation among the ummah and different groups taking their views as the only ‘correct’ way – it’s hard to see how this balance is practiced. Added to that, we live in an increasingly Islamophobic world, where politics, terrorism, and ideological warfare can so easily distract Muslims from actually understanding what Islam is, and how to live it in a way that we capture its purpose – and not just its outward, ritualistic forms of worship. Conferences like these are important in our society – particularly among the youth – because they give us the chance to have an intense focus, for a few days, on acquiring comprehensive knowledge of our religion and its expectations from us. These events are also unique because they expose attendees to a variety of different viewpoints – speakers from different generations, from different countries, coming from different ideological backgrounds. This speaker line-up for this year’s conference bears testimony to that. RIS2011 hosted young speakers such as Canada’s Shaykh Navaid Aziz, Durban’s Shaykh Bilal Ismail, and Cape Town’s Moulana Sarfaraaz Hamza; as well as older, more experienced speakers such as Shaykh Fadel Soliman (Egypt) and Shaykh Sa’dullah Khan (South Africa). The ever-popular Mufti Ismail Menk (Zimbabwe) kicked things off with a topic that pinpointed Islam’s encouragement of striking a balance in life: true Islam is a balance between total lack of belief (atheism) and being so strict in religion that you go beyond the boundaries that are prescribed by Allah. Mufti Menk gave several analogies that made the very purposes of Islam clear – such as the reasons behind the deen and Shariah. For example, if you have a driving licence, you can drive. But you have to follow the rules of the road – or else there would be chaos. Likewise, Allah has given us this life – but we have to follow the guidance He gave us, or else there would be chaos. In short, that’s what Islam is: it’s a means of regulating our lives so that we live in harmony – in a way that is balanced and just; and a way that brings us inner contentment, happiness, and success in both this life and the next. He also spoke of the battle we all face within ourselves. It’s like a seesaw – with obedience to Allah on one side, and obedience to Shaytaan on the other. The more you obey one, the less you obey the other. Shaykh Bilal Ismail took attendees through a day with the Prophet s.a.w., and gave a powerful talk on gathering provisions – good deeds – for the Hereafter. Using visuals and statistics from the natural world, he effectively showed that to understand the greatness of your Creator, you need to look at the creation around you. We’re often awed by the power of nature – such as the Blue Whale – which is physically huge; or Tsunamis, which can destroy entire towns in seconds. But while we’re often told of the science behind these things, everything ultimately goes back to Allah – the One who created all of it. His talks emphasised two critical factors for success. One was to serve humanity; and the other was a fast-track to self-purification of the heart (tazkiyyah): regularly make tahajjud salaah. One only needs to research tahajjud further – via ahadeeth and habits of our successful predecessors in Islam – to see how incredibly important it is in spiritual development. Among the many other topics at RIS 2011 were sessions on marriage, the role and potential of Muslim women, the value of time, and an effective session on social participation by speakers from Muslim Hands and Islamic Relief. Another highlight was the addresses by conference attendees: a born Muslim, a recent revert, and a non-Muslim all took the stage to express their appreciation for the event – speaking of the positive effects the conference had on them. Conferences like these serve to inspire attendees and revive their spirituality, but the organizers were very aware that the effects of RIS 2011 needed to last beyond just this weekend. The conference needed to serve as a catalyst for positive change, spiritual growth, and personal commitment to gaining new Islamic knowledge – with all this to continue far beyond the final day of RIS. The speakers planted seeds in the minds and hearts of attendees – inspiring them to take what they’d heard and apply it in their lives, families, and communities. And the accompanying conference pack included points of reflection that would help attendees take each topic beyond the weekend – into their personal lives for years to come. RIS 2011 was an amazing, inspiring, and entertaining event. But attendees now need to take personal responsibility for carrying it through into their lives. The question now is: what am I going to do with what I’ve gained from this conference? 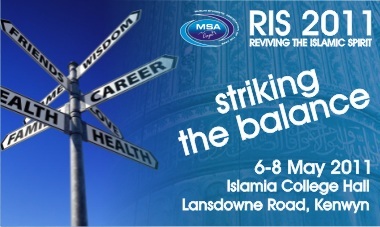 The DVD recordings of RIS 2011: Striking the Balance will be available from MSA Cape in June 2011, insha-Allah. Please email info@msacape.org if you would like to purchase a copy.